The signs are all around! New signs can boost ticket average and bottom line! Signs are seen every day but often forgotten about. 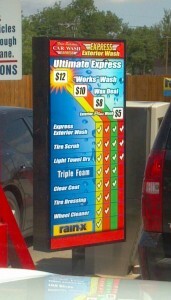 You should change up your signage anytime you have price increases or changes in services offered. Contact us today for help with your signs and or car wash packages. ← First impressions in the tunnel.